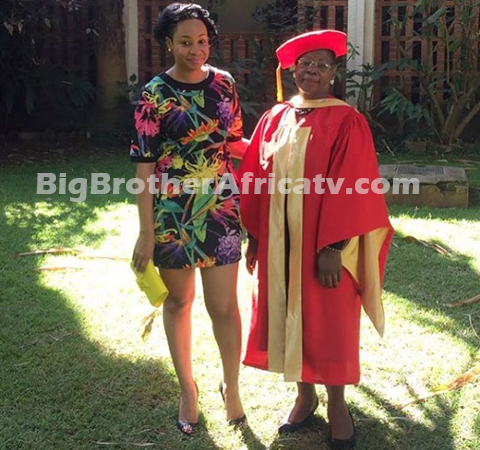 Big Brother Africa Chasemate from Zimbabwe, Pokello Kumordzie's Mom obtained her Doctorate this week, but then it was downhill from there. Pokello revealed that her phone got shattered after she dropped it "Dropped my fone on the driveway and it completely shattered, can a new screen and lcd cost 250usd tho😢😢😢 When u want to slap the lights out ur teenage son and he comes in with the block.u know this motherhood stage is going to be challengin", she wrote. The Queen of Swagger then took to one of her social platforms to share the good news of her dear Mom receiving her Doctorate with her follwers and fans. she posted a the photo above which she captioned: "With my Big Mama today getting her Doctrate.feeling so proud. See my face like baby next to her, Yeah im still mama's lil girl".